Check out the replay of the webinar— it’s worth it. Didn’t have time to check out Cloud BI Strategy: Do’s, Don’ts, and Gotchas? No problem. You can watch the webinar on demand. 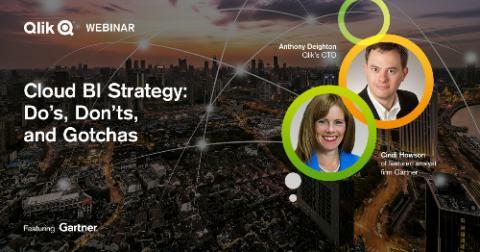 And you won’t want to miss hearing from Anthony Deighton, Qlik’s Chief Technology Officer and Senior Vice President, Products, who shared his insights on how Qlik’s hybrid cloud allows you to keep your data anywhere you like, choose where you deploy analytics over time, and stay secure and governed.